Leeks are generally under-appreciated in most US kitchens, and so growing leeks is not as popular in the US as it is in Europe. Most European gardeners consider leeks a staple, and often tuck them here and there around the vegetable garden because of their beautiful bluish color. 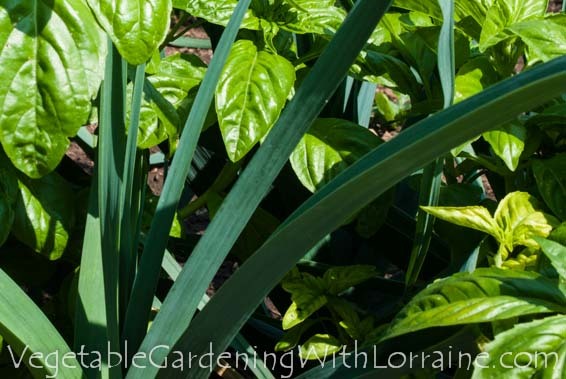 But if you’ve found your way to this article, then growing leeks is probably on your vegetable gardening plan for this year. You will not be disappointed. Leeks have such a wonderful mild onion-like flavor they will enhance almost any vegetable dish, soup, stir-fry or stew, and can be steamed or sauteed by themselves, or used as a topping for meats or seafood. A member of the onion family, leeks have leaves that are shaped like a V in cross-section, unlike onions, which have leaves that are hollow tubes (an O in cross section). Their origin is a bit of a mystery, since there are no real “wild leeks”. A plant known as “ramps” is sometimes referred to as “wild leeks”, but it is not believed that cultivated leeks were derived from this plant, as far as I can tell. We do know that they were grown in ancient Egypt, and by the middle ages were being grown in gardens throughout Europe. Leeks do not form bulbs, and therefore do not come in different day-length types like onions do. You don’t have to be concerned about getting a variety that matches your latitude, as you do with onions. evenly moist soil (do not let them dry out - but don’t drown them either. Drip irrigation is best as overhead watering makes them more prone to fungal diseases). Leeks can take from 50-150 days to reach maturity, depending on the variety. Days to maturity given on seed packets always means days from transplanting out, not days from putting seed in the ground, If you’re growing leeks from seed add 20-30 days to the maturity date. That means that leeks need generally need a long growing season! You don’t have to wait for leeks to reach maturity before eating them though - you can harvest and eat them at any time in the growing cycle. They are delicious both as tender young shoots and as giant old 2” diameter stems, it just depends on how you want to use them. If you’re going to be growing leeks from seed, get a jump on the season by starting them indoors 8-12 weeks before your last spring frost date. I plant two seeds in each soil block or tray cell. If both sprout, then I thin one out and keep just the biggest seedling. Harden them off as you would any seedling before setting them out. You can also start leeks from dormant, partially grown starts, which are available online from some seed companies. If you purchase these, follow the instructions that come with them. If you’re using raised beds with intensive hexagonal planting, plant on 6” centers; if you’re a row kinda person, plant them 6” apart in rows that are 24” apart. In order to develop tender white shanks, the bases of leek plants need to be grown in the dark, which is known as “blanching”. To do this, plant leeks in trenches that are 5-6” deep. As the leeks mature, backfill the soil up around the bases of the stems. Blanching leeks this way is what makes so many leeks gritty down inside the overlapping leaves. That’s okay - it just means that when you are preparing to eat them you’ll need to cut them vertically through the shanks in order to wash the grit out. Another way to transplant starts that makes blanching easier is to make 5-6” deep holes with a dibble and set the seedlings into the holes with just an inch or two of the tops sticking out. Fill in with only a sprinkle of soil. As the plants get watered, soil with slowly fill in the holes and the leeks will be blanched as they grow! A third way of blanching leeks is to place a toilet paper tube down over the seedlings when transplanting out. Partially bury the tube in the soil so that it will be stable, but make sure that enough leek is sticking out the top of the tube to receive the light it needs to grow. An advantage of this method is that it keeps grit from getting inside the shanks as they grow. Leek varieties include short-season varieties (which take 70-75 days to grow from transplant to maturity), long-season varieties (which take from 100-150 days), and varieties in between. While all varieties can be harvested and eaten at any size during the summer, the short season varieties are best for this and are referred to as “summer leeks”. The long-season varieties form the largest and stockiest shanks, and they can survive temperatures down to about 5° F when mature. They are called “winter leeks” because they can be left in the ground at the end of the season to overwinter under a thick covering of mulch. Some people think that “winter leeks” are planted in the fall and then grow over the winter, which could be true in climates that don’t get sustained hard freezes. But where there are months of below-freezing temperatures, both summer and winter leeks are started in the spring (or late winter indoors) and grown throughout the summer and fall. Winter leeks are the large, extra cold-hardy varieties that take a long time to mature and are usually not full size until fall frost or later. You can harvest them then, or just mulch them in at the end of the season and continue harvesting them throughout the winter. Be sure to mulch deeply enough to prevent the ground from freezing. If you're growing leeks where it is hot and dry in mid-summer, try the shortest-season varieties you can find and start them indoors under lights in late winter. That way you can harvest them before the blasting heat of summer sets in. For more information on leek varieties, you can visit the Cornell Vegetable Varieties For Gardeners page. Leeks are shallow-rooted plants and are easily harvested by pulling, along with a little help from a spading fork if the ground is dry or hard. Leeks are most flavorful when they are fully mature and have experienced a few fall frosts, and these make for the largest harvest and best storage, especially if overwintering in the ground. It’s a great pleasure to go dig leeks (and carrots) in the dead of winter! Harvested, mature leeks can also be stored layered in sand in a root cellar or shed that remains around 35° F. Stored this way they can remain fresh for a few months. Leeks contain a significant amount of a flavonoid called kaempferol, which helps protect blood vessels from damage. Leeks are also an excellent source of Vitamin K, manganese, and Vitamin B6, and are an excellent source of antioxidants.